Alongside the 911, it was easy to forget that the Porsche Boxster is also due for a refresh. Porsche has not forgotten about its enty-level sports car, though, and has delivered a brand new Boxster that is wider, lighter, and more powerful. The 2013 Boxster can be distinguished at a glance by its newly refined exterior and interior. The exterior sports some flamboyant side scoops, new lights similar in shape to the 918 supercar concept, and an overall tightening of its appearance. The interior sports q center console inspired by the Panamera and better materials. Also, the car is slightly widened to increase interior volume. This redesign bodes especially well for the new Cayman as well since the Cayman is basically a Boxster with a roof. 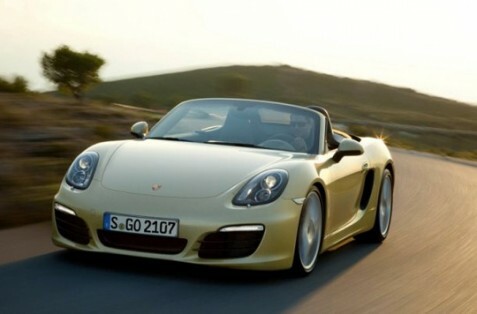 On the mechanical side, the non-S Boxster get a horsepower bump to 265hp and the S models get an increase to 315hp. Both models recieve either a 6 speed manual transmission or a 7 speed PDK option. Weight has also been dropped by 77lbs. Lighter, leaner, and meaner, the new Porsche Boxster sets its sights on driving out from under the 911’s shadow. That’s great. Another one to be anticipated ’til next year.